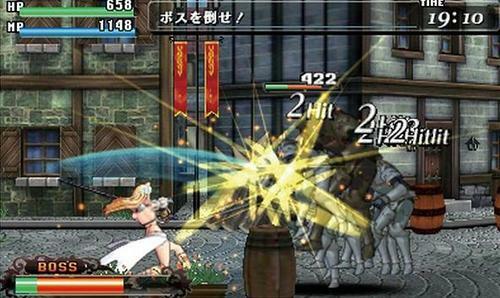 When I started up Code of Princess’ tutorial, I was greeted by Solange, a sword-wielding scantily-clad princess. In a paragraph or two, the game summed up its core concepts. Using a control scheme typical of 2D fighters, you have a wide variety of moves at your disposal to take on enemies. Solange herself demonstrated a few short combos: stuff that was easy to remember and ripe for experimentation. I’m a fish out of water in any fighting game that doesn’t have smashing or male siblings, but even I found it easy to get the hang of the three-hit combos Solange suggested. Not since Hany in the Road has there been so much lane-switching action in a video game. You can also leap between the foreground, mid-ground, and background in order to escape enemies or get around them. Thing is, they can do it, too. This allows Code of Princess to throw a ton of baddies onscreen without clogging things up, and it lends a sense of dynamism to the combat. Not long after starting the quest, I ran into Solange’s first companion, Ali the thief. Her dagger swipes had a shorter range than Solange’s sword swings, but Ali was also a great deal faster; she was difficult to use, but with practice, her moves left enemies little time to recover. Ali’s launcher move alone is like a three million-hit combo. I counted. Enemy AI gave me a hand in my practice. Your foes possess little to no intelligence, instead relying on sheer power and numbers to kill you. Oftentimes, this made them willing punching bags: mindless drones I could rough up in the process of honing my skills. If you want to breeze through, you can largely make it through Code of Princess by mashing the weak attack button. However, I found it much more gratifying to explore each character’s moveset and work out combo strategies. Your enemies won’t really care one way or the other. Granted, they do take on a number of fantastic forms, such as living trees and giant skeletons. Practicing combos sounds daunting to a newbie, but it’s just a matter of trying out each move individually. With time, you’ll gain an eye for the right time to use each move one by one. And it helps that Code of Princess limits itself to accessible button inputs. This was honestly my biggest fear going into the game, since I don’t feel entirely comfortable with the 3DS’ control pad. Thankfully, the most complex special move is down + forward + attack. You can even display a movelist on the bottom screen, making for easy reference. 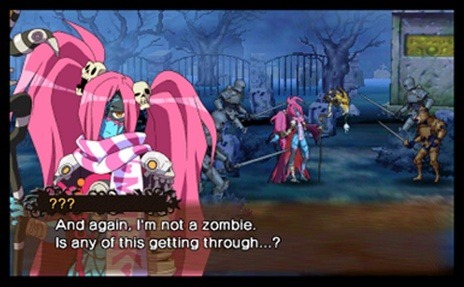 When I ran into the zombie necromancer Zozo, I began to see the variety in Code of Princess’ cast. Her combos are awkward to land and not very effective. On the other hand, her ranged spells cut down huge swaths of enemies. One of her special moves releases a giant laser beam which deals massive damage to everything in its path and sets its victims on fire. If an enemy touches another while on fire, the second enemy will recoil and catch on fire, as well; this can lead to giant chains of burnt bad guys. Careful, though, as you yourself are vulnerable to the fiery touch. Watch with base glee as giant ogres fall victim to the being-on-fire status. The variety of movesets between characters is one of Code of Princess’ greatest strengths. Though each character knows a long list of moves, all of a character’s abilities point to one general purpose, whether it be focusing on a single enemy, clearing out enemies on all sides of you, or something else. In turn, each of the four characters has a unique use, and I got a kick out of choosing the right character for a mission. For instance, Zozo’s spells can clear out large groups of baddies at once, while Ali’s combos make quick work of bosses. 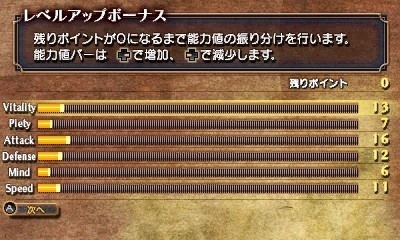 And Zozo’s unique abilities were crucial to deciding her stat growth. When you clear a mission with a character, that character gains experience points, and with enough experience, a character levels up. At each level, you gain skill points to ration among a number of attributes. When I tried to balance out Zozo’s skill points, she got nowhere; she didn’t stand a chance against newer and tougher enemies. Rather, I found the key was to choose a few stats and stick to them. Because she was reliant on magic, I focused on her magic strength. Also, she wasn’t very mobile, so I threw in some defense. If she couldn’t evade an attack, she should at least be able to weather it. Earn a level up, and you’ll come to this screen for depositing skill points. Er, sans the Japanese text. For Ali, on the other hand, I allocated skill points to strength and speed. The strength gave her combos even more of a punch, and if she ever got surrounded by enemies, the speed would help her escape. You’ll also find and buy pieces of equipment for boosting certain stats, and they often come with special bonuses that can prove invaluable depending upon the circumstances. I don’t like to think about the final member of the party, the jester Allegro. Not because he’s a slouch in combat—to the contrary, his guitar strums serve as powerful area of effect attacks—but rather, because his dialogue was the most painful. I’m not sure a single cutscene went by without his meta shtick about posing as a level 99 near-sage. Allegro isn’t alone; Zozo gets her own endlessly hilarious running gag. Although I came to love controlling the characters, watching them talk wasn’t really my bag. The story contains obligatory twists and turns, but the plot itself is purposely half-hearted. Rather, the heart of the story is in hearing the party members gab with one another before each mission, trading soulless—though goofy—jokes. If you do dig the sense of humor, you’ll be glad to hear that the game is fully voice acted. If you don’t, the dialogue is easily skimmed and quickly skipped. Admittedly, the story does introduce some very fun-to-use bonus characters. There are more bonus characters than main characters, and a good number of them come with their own hefty moveset. You can drag these guys through story missions you’ve already cleared, or you can use them in bonus missions. There’s a huge selection of bonus missions, and there’s enough super-difficult ones to serve as a satisfying post-game. Actually, I had a particularly fun afternoon taking one of the extra characters through every mission from the main quest using the game’s online mode. 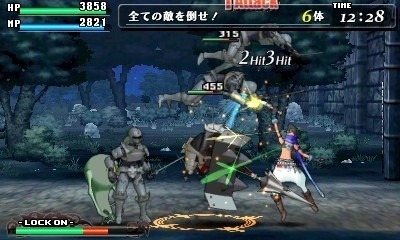 You can choose to duel or complete a coop mission with up to three other people. I’ll admit, taking some time to mindlessly button-mash through the game in some multiplayer mayhem can be gratifying in its own right. The connections I found were, for the most part, pretty smooth. You can also tackle multiplayer using 3DS ad hoc multiplayer if you know someone else with the game. It’s a rigamarole most of us have been through with one game or another. String various moves together, see what works and what doesn’t, and perfect your timing. Code of Princess doesn’t do anything to contribute to the action genre, but the resulting package is certainly solid and definitely accessible. Now that I’ve been through the game and a decent smattering of bonus missions, I want to try it again. Can Ali be successful if I focus her on other stats, like vitality or mind? How much easier will the game be if I limit myself to three or two characters, letting them hog the experience? I’ll have to let you know once I manage to bring myself to delete my save data. Unfortunately, Code of Princess only supports one save file at a time. I went the whole review without mentioning Guardian Heroes. Well-rounded cast of characters, each with a unique use. If you’re up for it, there’s a combat system with combos to learn. Even folks with two left thumbs can learn to juggle bad guys if they’re so inclined. On the other hand, you’re also free to approach this game as a mindless brawler. Tons of extra missions—just don’t expect any unique content. In order to create an accessible game, combat lacks depth. 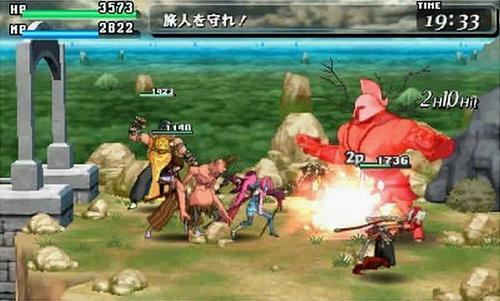 Most notably, enemies don’t put much variety into their attacks and defenses. Though ultimately bereft of anything thought-provoking, Code of Princess is an extremely well produced game with combos to discover and mayhem to cause. Purchased new in 2012 for $39.99. This is a robust and quality title chock full of content and frantic multiplayer modes. It’s hard to go wrong putting down $39.99 on this one.